A few months ago, I’ve contributed a new component to Symfony: WebLink. By implementing cutting edge web standards, namely HTTP/2 Server Push and W3C’s Resource Hints, it brings great opportunities to boost webapp’s performance. Let’s discover how easy it is to use it and the real life benefits you can expect. 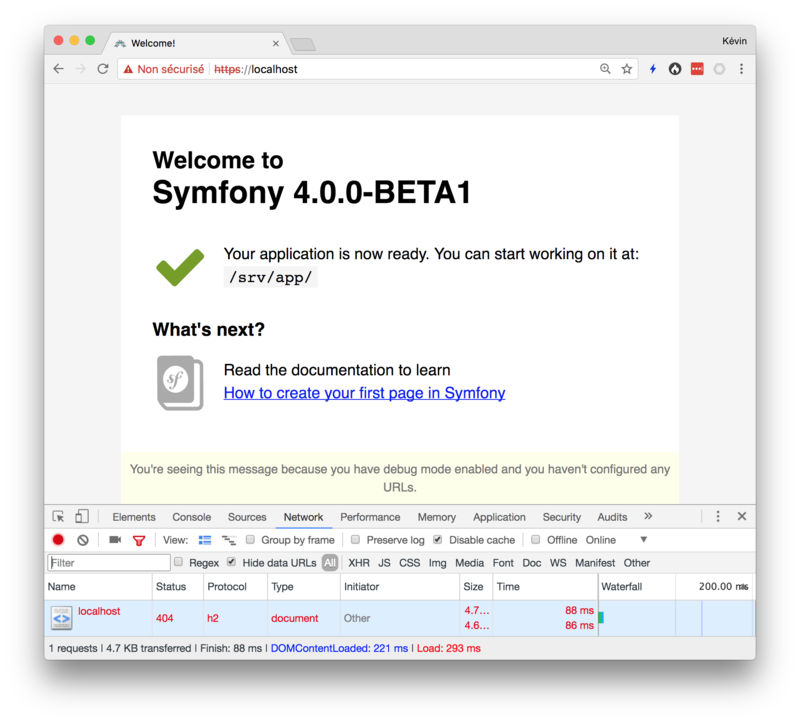 The WebLink components is available since Symfony 3.3 (it means you can start to use it today), but in this article I’ll use Symfony 4 to celebrate the release of its first beta yesterday! To get started, download my Docker installer and runtime for Symfony 4/Flex. It includes everything you need to run Symfony (PHP 7.1 configured properly for Symfony, and Composer) and a development reverse proxy (Apache) supporting HTTP/2 Server Push and HTTPS (most clients only support HTTP/2 over TLS). Flex is smart enough to download Twig, automatically register it into Symfony and enable Symfony features requiring the library. It also generates a base HTML5 layout in the templates/ directory (we will not use it but you should). Now, download Bootstrap 4, extract the archive and copy the file dist/css/bootstrap.min.css in the public/ directory of our project. As you may know Symfony already has a nice integration with the upcoming version 4 of the most popular CSS framework. Note: in a real project, you should use Yarn or NPM with Symfony Encore to install Bootstrap. 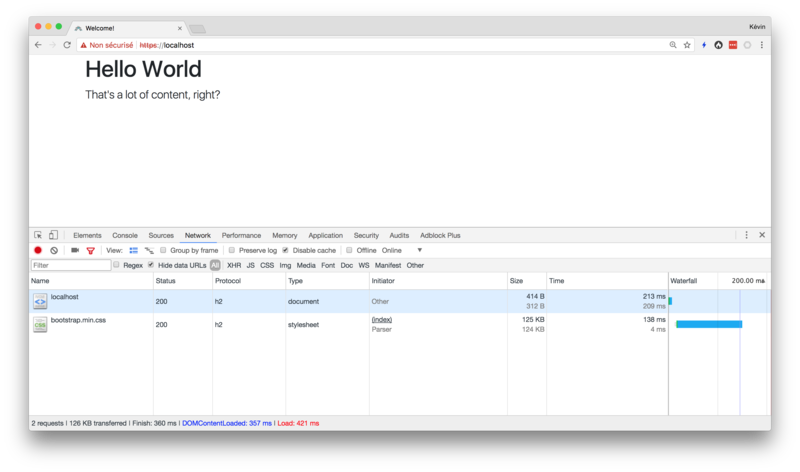 2 HTTP requests are issued by the browser, one for the homepage, and another one for Bootstrap. But we know from the very beginning that the browser will need Bootstrap. Instead of waiting that the browser downloads the homepage, parses the HTML (notice “Initiator: Parser” in Chrome DevTools), encounters the reference to bootstrap.min.css and finally sends a new HTTP request, we could take benefit of the HTTP/2 Push feature to directly send both resources to the browser. Let’s do it! As for Twig, Flex will automatically download and register this component into our app. Reload the page: As you can see (Initiator: Push), both responses have been sent directly by the server. bootstrap.min.css has started to be received before the browser even requested it! According to the Preload specification, when a HTTP/2 server detects that the original (HTTP 1) response contains this HTTP header, it will automatically trigger a push for the related file in the same HTTP/2 connection. The Apache server provided by my Docker setup supports this feature. It’s why Bootstrap is pushed to the client! Popular proxy services and CDN including Cloudflare, Fastly and Akamai also leverage this feature. It means that you can push resources to clients and improve performance of your apps in production right now! All you need is Symfony 3.3+ and a compatible web server (the free version of Nginx doesn’t support Server Push) or CDN service. Before using HTTP/2 Push, be sure to read this great article about known issues, cache implications and the state of the support in popular browsers. It is already as a standalone library by the Bolt CMS. While we’re speaking about interoperability, WebLink can deal with any link implementing PSR-13. Thanks to Symfony WebLink, there is no excuses to not to switch to HTTP/2! Learn more about these new features in the relevant Pull Requets: #22273 and #21478. Your Symfony app is slow? Contact Les-Tilleuls.coop, we can help you make it fast! Can I get the contact person to join and get more information? In the BlogPostAction.php example, you are adding the attributes to the request, not the response – I suspect this is an error? And if you add the attribute _links to the response, does Symfony automatically convert that into Link HTTP headers? Attempted to load class “Link” from namespace “Fig\Link”. Did you forget a “use” statement for e.g. 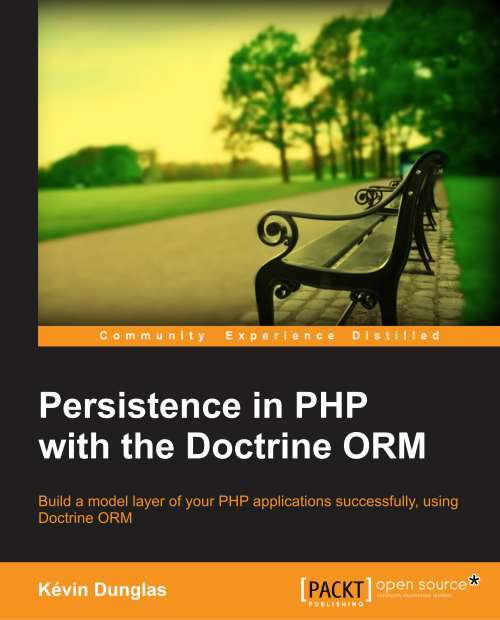 “phpDocumentor\Reflection\DocBlock\Tags\Link” or “Symfony\Component\DomCrawler\Link”? twig-bridge is already installed via composer. Do you know how this issue can be resolved?